Q1: Read source 2 and explain why source 1 is so important to historians? What information is provided in source 2 to suggest that 1536 marked a change in the looks of Henry VIII? A1: The portrait of Henry VIII (source 1) is the only universally accepted portrait of him by Hans Holbein to survive. In January 1536 he was badly injured and after that got very little exercise and from that date he put on a lot of weight. "His (Henry) impressive physique soon began to show the evidence of his rich diet and reduced exercise." Q2: In source 2 the author gives precise details about Henry's waist and chest sizes. Where do you think this information comes from? A2: This comes from the man who made the king's armour. Q3. 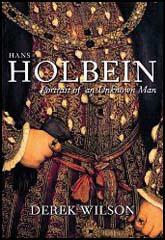 Select passages from source 3 where the author suggests that Holbein did not flatter Henry VIII. Do you agree with this assessment. If so, why did Henry not destroy the portrait? You might find it helpful to read source 6 before answering this question. A3. Helen Langdon describes the portrait as showing an "overbearing and tyrannous monarch" with "small, humourless eyes and mouth" (source 3). Xanthe Brooke suggests that the "somewhat unflattering likeness but politically useful image, enhancing his authority and assertiveness, must have pleased the King, for Holbein used it as the basis of his first draft of the full-length life-size portrait of Henry VIII for the Whitehall mural" (source 6). It is believed, because of its size, the painting was taken around Europe to be shown to foreign kings. Henry wanted these king's to fear him. Many people have commented on Henry's "cruel eyes". Henry probably approved of this picture as he wanted people to be aware that he was capable of being cruel if people resisted his rule. Q4: Read source 4. How does Tom Lubbock support his view that the painting has "a rigorously artificial design"? A4: Tom Lubbock points out Holbein's "high-definition realism" is forced into a rigorously artificial design". He points out that "the whole right-hand edge of the king's face, from eye to chin, is made into a precisely straight, precisely vertical line". Lubbock adds that "the top of his shoulders becomes a near horizontal line going right across the picture, making the king's torso beneath it into a sub-rectangle" and "the edge of back of the head, behind the ear, also has a straight, upright, run, which meets the jutting-out back of the black hat in another right angle". Q5: Read sources 8 and 9 and then explain why source 5 is so important to historians. A5: In 1537 Holbein painted a large wall painting for the Privy Chamber in Whitehall Palace. The painting was destroyed in a fire in 1698. Source 5 shows the preparatory drawing that Holbein made for the painting. Q6: Select sources from this unit that suggests that Holbein changed his mind about Henry's image that was to appear on the wall of Whitehall Palace. A6: Source 11 shows a copy of Holbein's wall painting by Remigius van Leemput that was commissioned in 1667. It was seem that the finished portrait "Holbein reorientated the face of the king so that it looks directly at the viewer" (source 9). The two copies of the original painting (sources 7 and 10) also shows Henry looking directly outwards. Q7: Why are experts so convinced that source 7 was not painted by Hans Holbein? A7: Art historians have compared the painting of Henry VIII (source 7) with those we have that were definitely painted by Hans Holbein. They all conclude that Holbein did not produce these paintings.